Sargent Shriver is one of my liberal heroes among 20th Century American politicians. A member of the Kennedy clan by marriage (to Eunice Kennedy), Shriver created and was the first director of the Peace Corps, provided the impetus for the War on Poverty, founded Head Start, Job Corps, VISTA, and Legal Services for the Poor, and, following Eunice’s lead, co-founded Special Olympics. William Shriver [Shriver’s great-grandfather], although he was opposed to slavery, was a great champion of states’ rights and ardently supported the Southern cause. Six of his nine sons would serve in the Confederate army. Just across the road lived William’s brother Andrew, who, despite being a slave owner, was a staunch Unionist; his son was serving in the Twenty-sixth Emergency Regiment of Pennsylvania Volunteers. In our contemporary era, Civil War studies do not seem to acknowledge such complexity. In our time, we tend to find the most simplistic explanations, get them trending on the internet and in the classroom, and let them be until a new trend emerges. I have not spent a lot of time on my family genealogy but I do know that I, like Shriver, have ancestors who fought on both sides during the Civil War. Shriver’s were from Maryland; mine were from Alabama, Mississippi, and Tennessee. To the best of my knowledge, none of my ancestors owned slaves. At that time, and based on the history of the parts of the South where they settled, they may have never even seen a slave. James Baldwin, who was educated in a more progressive education system than we have now, wrote, “The paradox of education is precisely this — that as one begins to become conscious one begins to examine the society in which he is being educated.” That is the paradox that we must strive to renew as we re-learn how to convert information into knowledge. Here’s perspective: Hugo Black of Alabama, one of the great liberal justices of the U.S. Supreme Court, whose hand is on some of the most sweeping civil rights legislation and social reform in American history, joined the Ku Klux Klan in the 1920s as a young Birmingham attorney and politician. His membership is neither justified nor forgivable but it’s complicated. Black, in retrospect, said that back then “I would have joined any group if it helped me get votes.” When FDR’s appointment of Black to the Supreme Court was confirmed by the U.S. Senate, that body was aware of his past membership in the Klan. The Senate – which was a more rational institution then than it is now – looked past Black’s past to what he had become and confirmed a man who is still considered one of the most liberal and progressive members in U.S. Supreme Court history. Michiko Kakutani, literary critic for the New York Times, who has always had a tin ear for nuance (bless her heart), declares Atticus Finch to be a racist in her review of Harper Lee’s newly published Go Set a Watchman. I’m not sure, based on the evidence, that is what this novel is saying. One of the great talents shared by most Southerners in my experience is a talent for nuance. Many non-Southerners find that talent to be dissembling and irritating; I find a talent for nuance to be vanishing but still a great advantage in most human relations. 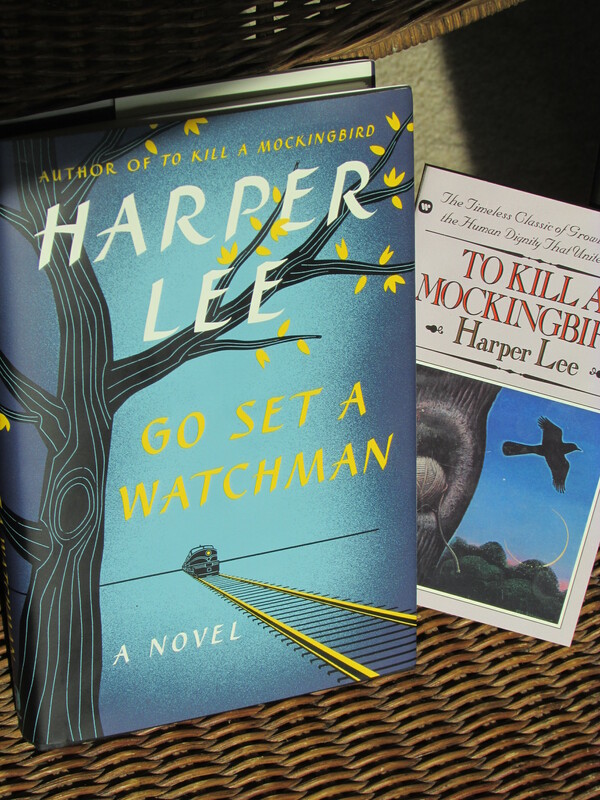 The copy of Harper Lee’s new/old novel Go Set a Watchman that I pre-ordered in February was at my front door when I arrived home from a friend’s funeral this past Tuesday, the day of its release. I finished it this weekend. It’s an interesting read and I was entertained. It is especially intriguing as the draft for what would become To Kill a Mockingbird. I’m not sure if I think it should have been published and I’m pretty convinced that Harper Lee’s sister, Alice – who handled Harper Lee’s legal and professional affairs, would have never allowed its publication if she had lived (she died last year at 103). Unfortunately, driven by curiosity, I read the advance press and reviews so the book itself didn’t have many surprises. The big headline and web buzz has been that Atticus Finch has now been revealed as a racist by well-meaning reviewers like Kakutani. I have to disagree. Atticus Finch has now been revealed as a product of his times. The book, even though it has only now been published, was written sixty years ago and in it Atticus expresses views that were not uncommon to thoughtful and concerned persons – Northern and Southern – of the 1950s. They might be repugnant to us now but it is essential to look at them critically and with perspective and context. Some detractors of To Kill a Mockingbird – Flannery O’Connor famously and Truman Capote allegedly – dismissed it as a “children’s book.” That doesn’t seem to me to be a flaw although it is true that most readers of Mockingbird come to it at a fairly young age. But I think a root of that criticism may be the feeling that Atticus Finch is just too good to be true. Now we know that Atticus – like Lincoln, like Jefferson, like all of us – is a flesh and blood human being and a product of his times as we all are (“let he who is without sin” etc. …). Real people have real flaws. In the 1950s and 1960s there were well-meaning people who urged caution and restraint in the Civil Rights Movement and who had doubts and fears about the right way to proceed. Martin Luther King, Jr.’s “Letter from Birmingham Jail” was originally addressed to well-meaning but reluctant Birmingham clergymen who were expressing concern that the Movement should be showing more patience and restraint. Go Set a Watchman presents Atticus Finch as another of these people urging caution and restraint and, let’s be honest, harboring a fear of the unknown. What has been overlooked by reviewers, I think, is that Jean Louise, the grown up Scout from Mockingbird, has more than her share, by contemporary standards, of jarring and politically incorrect statements. Harper Lee’s Go Set a Watchman may be flawed and incomplete but it is unflinchingly honest. In Go Set a Watchman, Atticus attends a Citizen’s Council meeting and curtly introduces a rabidly racist speaker to spew his venom; “because he wanted to” is Atticus’s explanation to Jean Louise. It is also revealed that Atticus attended one Klan meeting decades earlier but did not join and did not go back. It is suggested by Atticus’s law clerk that Atticus’s attendance at incendiary meetings is a way to find out who stands where on the issues of the day. Based on Atticus’s statements to Scout, however, it is suggested that Atticus might have common ground with some of their more reactionary rhetoric. Troubling statements are made. Harper Lee, even as she was writing in the mid-1950s, was aware of the various nuances involved in what was going on in her hometown and in the country. She explored them as she wrote Go Set a Watchman and she eased them toward perfection as she rewrote the earlier novel and created To Kill a Mockingbird. In Mockingbird Lee found a way to make the issues enduring and universal. If she had stopped with Watchman, she would have had, I think, a minor novel exploiting the headline issues of the day and passing quickly from memory. In Watchman Lee presents an Atticus who is struggling with his beliefs and with his traditions and who, we can only hope, will come out on the right side of history. In To Kill a Mockingbird – even though it is set two decades earlier – she brings Atticus’s promise to fruition. This entry was posted in Go Set a Watchman and tagged "Sewanee in Ruins", Abraham Lincoln, Atticus Finch, Go Set a Watchman, Harper Lee, Hugo Black, James Baldwin, Jr., Martin Luther King, Michiko Kakutani, Richard Tillinghast, Sargent Shriver, To Kill a Mockingbird, W.E.B. Du Bois on July 19, 2015 by gedwardjourney.